Watch The Walking Dead Season 6 full episodes online, free and paid options via our partners and affiliates. On The Walking Dead Season 6 Episode 16, the group must go outside the walls to save one of their own but it changes their lives forever on the season finale. On The Walking Dead Season 6 Episode 15, search parties head out when Alexandria is alerted someone is missing, but what they find isn't what they hope for. Two different groups leave Alexandria on supply runs. While both are concerned with the future of the community, immediate danger will derail them. On The Walking Dead Season 6 Episode 13, immediate danger derails two different groups that leave Alexandria on supply runs. On The Walking Dead Season 6 Episode 12, Rick and the group may be outmatched as they realize they must fight a new enemy in order to survive. On The Walking Dead Season 6 Episode 11, decisions must be made about where to go next when Rick realizes that Alexandria might not be as safe as he thought. On The Walking Dead Season 6 Episode 10, when the group isn't the only one vying for an unexpected supply goldmine, a simple scavenging run turns tricky. On The Walking Dead Season 6 Episode 8, after just a few moments of peace, Alexandria is once again under attack but this time the threat is even more deadly. On The Walking Dead Season 6 Episode 7, there's peace between the group as Alexandria is finally able to start pulling itself back together. On The Walking Dead Season 6 Episode 6, Daryl, Abraham and Sasha try to return to Alexandria after a mission but run into obstacles including a new threat. On The Walking Dead Season 6 Episode 5, after a number of setbacks which could prove too much for the citizens inside the gates, the mood in Alexandria is grim. On The Walking Dead Season 6 Episode 4, with everything that has happened can anyone be trusted as a new setting and new another new face arrives. On The Walking Dead Season 6 Episode 3, when someone returns back home the reunion doesn't quite go as planned. On The Walking Dead Season 6 Episode 2, just as things look as though they will begin to return to normal a new problem turns up for the Alexandrians. The aftermath of Pete and Reg's deaths are felt as the community of Alexandria deals with new circumstances and Rick Grimes takes on leadership. Did you take one of my protein bars? Permalink: Did you take one of my protein bars? The Walking Dead Season 6 Report Card: Best Episode, Worst Twist & More! 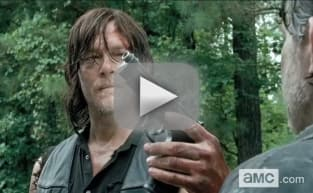 The Walking Dead Season 6 Midseason Premiere: Watch the First 4 Minutes NOW!